Desert Encounter under Jockey Andrea Atzeni captures the $800,000 dollar Pattison Canadian International. 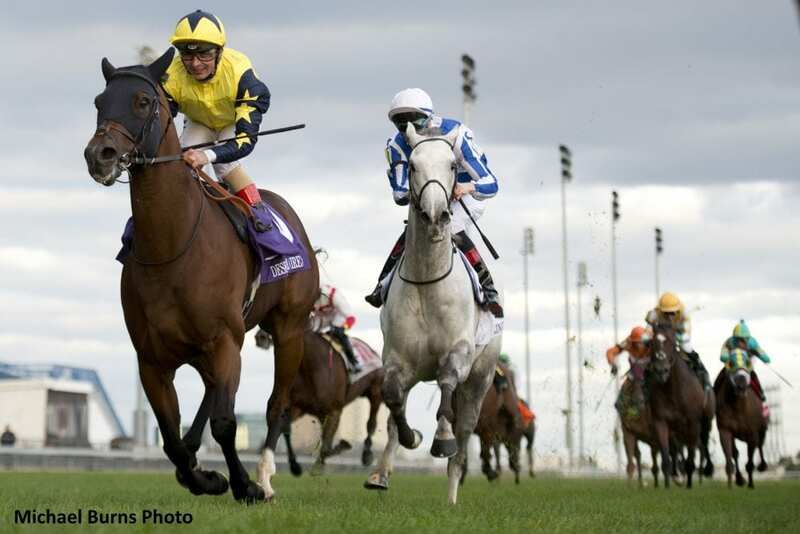 Making his first start in North America, Abdulla Al Mansoori's Desert Encounter proved explosive over the Woodbine lawn when he captured the Grade 1 Pattison Canadian International on Saturday. The 6-year-old gelded son of Halling, sent off at odds of 8-1, circled the field in the stretch to run down 3-1 favorite Thundering Blue by just over a length on the wire. Ridden by Andrea Atzeni for trainer David Simcock, Desert Encounter completed 1 1/2 miles over the “good” turf in 2:28.88. Funtastic was quick out of the gate, but sophomore Bandua and Adam Beschizza took over the lead after a first quarter in :25.67. Bandua led by just under a length over Tiz A Slam, with a well-bunched group behind including Thundering Blue, Khan and Markitoff. Meanwhile, Desert Encounter was relaxed early in second-last position, tracking fractions of :51.12 and 1:16.17. Turning for home, Thundering Blue fought his way through the pack to take the lead, but Atzeni and Desert Encounter were flying late down the center of the turf course. Desert Encounter wandered about a bit in the final 50 yards, but crossed the wire a winner by just over a length. Thundering Blue had to settle for second, while Focus Group got up for third over Tiz A Slam. Bred in Ireland by Tally-Ho Stud, Desert Encounter was a $54,086 yearling purchase at Tattersalls. The International is his first Grade 1 victory and eighth win overall from 23 career starts; his share of the $800,000 purse increased his overall earnings to over $850,000. This entry was posted in NL List, Racing and tagged abdulla al mansoori, andrea atzeni, david simcock, desert encounter, halling, pattison canadian international, thundering blue, woodbine by Paulick Report Staff. Bookmark the permalink.